Unnecessary Roughness. This is the picture I study when I need to “get in the zone” to write. The link between football and aggression is all over the news, whether we’re talking about Jovan Belcher’s murder/suicide, the New Orleans Saints bounty scandal, or incidences among local high school teams. Clearly, football players face issues that are complicated by society’s expectations for the sport. Mix that up with teenagers who are trying to figure out what it means to become a man and when aggression is acceptable—and the concept is rich with possibilities. Unnecessary Roughness is an attempt to continue the dialogue on these issues. The only actor that comes to mind is Channing Tatum, and the only reason I think of him is because he reminds me of my oldest son, and this book—in many ways—starts with my son. It’s game on for senior football captain Kurt Langer, and the stakes are high: A college recruiter wants fifteen tackles per match-up and Kurt’s team expects another state championship banner…but after a player from a rival school jacks Kurt up in the locker room, Kurt adds boxing to his workout routine, and he becomes more aggressive than ever—on the field and off. Unnecessary Roughness is the story through which I learned craft while enrolled in the Vermont College MFA program, so I guess <gasp> it took two years. If I compare my story to the fabulous Tim Tharp and his Knights of Hill Country will you forgive me? I mean, the guy is a flipping genius! 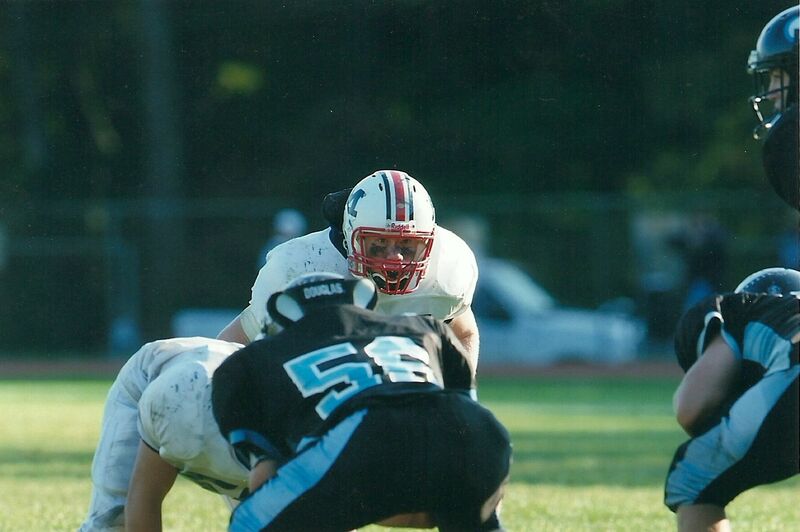 My son was an inside linebacker his senior year when he blitzed the quarterback, wrapping up the opposing player in a game-changing sack that sent fans to their feet. When he and the QB landed on the turf, my son felt the guy’s leg snap. I’ll never forget watching him watch the ambulance. 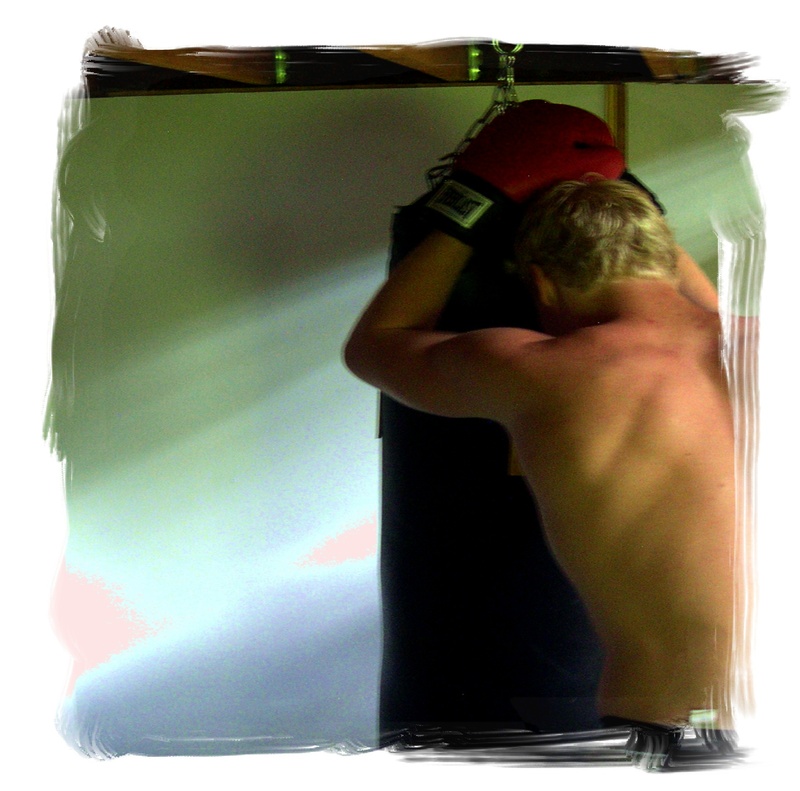 Unnecessary Roughness is about a football player whose coaches are pushing him to become aggressive on the field, so he starts training with a boxing coach to gain confidence—and he ends up becoming more aggressive off the field as well. Oh, and there are these two girls…. There is one week until the start of districts when the “real” wrestling begins. That’s the fuel the coaches inject in their battered, food-deprived, and weary wrestlers. The season has been practice; the post-season is the payoff. Top three wrestlers in districts wrestle at regions. Top three wrestlers at regions wrestle at states. In New Jersey, even an invitation to states is so prestigious it can result in a college recruitment. For many, these dreams start when the wrestler is in grade school. Such is this sport. It requires a childhood to ferment. Sometimes at the start of matches the ref will talk to each team, and sometimes he will mention moves that are so dangerous they are designated as illegal, and off-limits to the wrestlers. One of these moves is something like this: you may not trap your opponent’s arms and then slam him to the mat. Doing so means that the wrestler with the immobilized arms has no way to break his fall. It’s not only dangerous, it’s hard for the ref to stop because it happens so quickly. This is a move that we must trust opponents not to pull. Wednesday night, my son’s opponent hit this move. 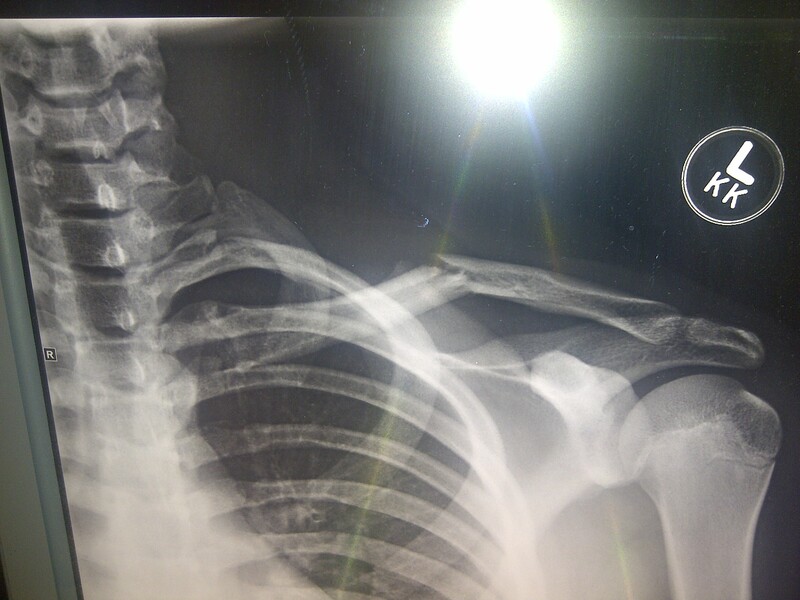 The picture above shows the result: a snapped clavicle. As if that weren’t enough, the wrestler who did this taunted the crowd, his team and fans booed the trainer’s decision to stop the match and award it to my son, and the opposing coaches challenged the trainer, chastising his decision. Sanity left the gym that night, replaced by the worst stance we can find in sports: the desire to win at all cost. After years around this sport, I’ve noticed that wrestlers are accustomed to being misunderstood. Their conditioning, the muscle they work so hard to build, the moves they spend long hours to learn—most of these are not used off the mat. The days they spend watching what they eat, the hours of anxiety—the need to hole up and wall themselves off, and the fear—the never-ending fear— that they will lose and lose big makes them different. They know this. They accept it. They are a brotherhood. The best wrestlers are also a complex set of contradictions. How can a wrestler be tough yet show concern and compassion for a friend? How he remain focused on his own run at states yet agonize over someone whose chance has ended? How can he give one hundred percent on the mat yet find the emotional pool to sit with an injured teammate? How can he try every move he’s learned in order to beat an opponent, yet chose not to hit those that are deemed illegal? Ask the Mendham High School wrestling team. They are the indisputable champs. My son wrestles. He has made a thousand decisions prior to this night of competition, when he will wrestle under the spotlight, in front of his friends, his friends’ parents, his teachers, and his football coaches. A hundred times he has run the track, during practice as well as after, on his own time. He has sprinted the hallways, the stairwells, and the wrestling room, carrying his partner. Push-ups, sit-ups, sandbag carries—his aches and pains make him slow to stand, stiff to descend stairs, always groaning. We buy Advil in pint-sized containers. We have baggies of ice stuffed in the freezer. Every day starts with my son stepping on the scale. He rations his food, he knows about salt and empty calories and the need for protein and the importance of hydrating. On the day of a wrestling meet, he tries to stay focused for school, but his mind snaps to his match, over and over. Iron to a magnet, the worry refuses to give up its elemental hold. His opponent has a nearly same record. The match will be close. When my son jogs out and shakes hands, my own hands tremble in my lap, betraying my practiced calm. My mouth goes dry. I say a silent prayer, please God, no injuries for either boy. I don’t think wrestling builds character. Wrestling can feed egos, create whiners, and empower bullies. I’ve seen wrestlers who experiment with drugs, wrestlers who hurt their own teammates, and wrestlers who quit when the season gets difficult and the losses pile up. Life builds character, or not—depending on how you go through it. Wrestling provides a stage, that’s all. We all know this sport is not only about winning. If it were, our sons would only want to wrestle the kids who don’t know a head-lock from an underhook. If it were, they would tether their self-worth to praise from their coaches. If it were, wrestling would create only monsters with egos and despairing losers with no self-regard. To be sure, some of these exist. Moms, we can do better. We know better. Do you want your son to be humble? Then remind him to thank his coaches for helping him. Remind him—win or lose— to show his opponent respect. Remind him to help his teammates, no matter their skill level. Do you want your son to be strong? Then praise him for working hard. Nudge him toward the weight room. Show him how to eat right. Cook for him, with him, or beside him—however you run your house. Don’t forget, all that strength can help you too. You drive him to practices. He can help with yard or housework. Teach him that relationships work best when they feel balanced, when we give what we can when we can. Do you want your son to be responsible? Help him wash his own clothes. Help him make his own food. Help him write a schedule for Sunday, when he can work ahead in school. Help him, don’t do it for him. When he’s an adult and he’s tired, he will still need to finish household chores. Prepare him now, and he’ll be one step closer to responsible adulthood. This is a young man in front of you. You want him to be capable and strong and–maybe, like me–you want him to win. Tonight, I want this win deep inside my bones. He wrestles aggressively. He looks good on his feet and gets the first take-down—a single leg. No other score the first period, then he escapes at the beginning of the second period. He’s up 3, nothing. Then, I don’t know what happens…something sloppy and he’s reversed. He knows better. He knows better. But he’s pinned. He hangs his head as he leaves the mat and hurries into the hallway. He sits against the wall, tears of rage and humiliation run tracks through the sweat on his face. His coaches will talk to him. His teammates too. They know when to find him, what to say. In the meantime, the tears are okay. They mean he cares deeply that he’s lost. Maybe he’ll feel sorry for himself. Maybe he’ll wish he’d done something different. It’s all good. When I see him, I will wrap my arms around his neck and tell him I love him. That’s all he needs from me right now. Tomorrow, he’ll weigh himself and we’ll talk about what to eat, and then he will carry the garbage cans out to the curb.